The peculiar anatomy of pancreatic ducts in pancreas divisum (PD) may interfere with the development of acute chronic pancreatitis. In the presented case, PD influenced the evolution of lesions after pancreatic trauma. A 38 years old patient refferred to our hospital with recurrent episodes of mild pancreatitis during the last two years. The first episode occurred four months after blunt abdominal trauma. Endoscopic Retrograde Cholangiopancreatography, Magnetic Resonance Imaging of upper abdomen and Magnetic Resonance Cholangiopancreatography disclosed pancreas divisum, changes consistent with chronic pancreatitis in the dorsal pancreatic duct, atrophy in the body and tail of the pancreas and a pseudocyst in the pancreatic head, that was drained endoscopically. Pancreas Divisum may interfere with the evolution of posttraumatic changes in the pancreas after blunt abdominal trauma. Pancreas divisum (PD) is the most common congenital anatomic variant of the pancreas. It has been associated with the pathogenesis of acute pancreatitis. PD may also have a role in the development of chronic pancreatitis [1, 13, 15]. In the present report PD has interfered with the evolution of chronic pancreatitis after blunt abdominal trauma. A 38 years old male was admitted to hospital with an acute episode of mild abdominal pain with raised levels of serum and urine amylase. The calcium level was within normal limits (8.9 mg/dl). He had a history of 8 episodes of mild acute pancreatitis during the last 5 years, that were introduced four months after severe blunt abdominal trauma. An ultrasonographic examination, disclosed a cystic lesion at the head of the pancreas. 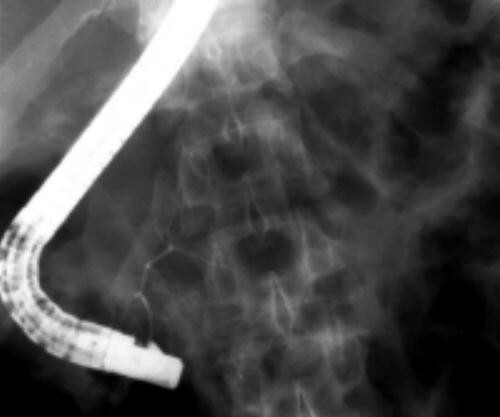 Consequently, the patient was referred for endoscopic retrograde cholangiopancreatography (ERCP). Cannulation of the major papilla revealed a short pancreatic duct branching off regularly, without continuation along the body and tail of the pancreas (fig. 1), suggesting a pancreas divisum. The minor papilla could not be cannulated and thus the dorsal duct was not depicted. The patient underwent Magnetic Resonance Imaging (MRI) of upper abdomen and Magnetic Resonance Cholangiopancreatography (MRCP). MRI demonstrated significant atrophy of the body and tail of the pancreas (fig. 2). A small, clearly demarcated cystic lesion was demonstrated in the pancreatic head, in close proximity to the duodenal bulb (fig. 3). MRCP revealed a dilated and irregularly beaded dorsal pancreatic duct with side branch ectasia in the body and tail of the pancreas (fig. 4). A short stenotic segment of the duct was demonstrated at the pancreatic neck. The cystic lesion in the pancreatic head was in continuation with this stenotic segment of the pancreatic duct. The duct was shown draining in the duodenum 1–2 cm superiorly to the draining point of the common bile duct (CBD). The CBD drained in conjunction with the short ventral pancreatic duct at the major papilla. Diagnosis based on ERCP and MRCP findings was pancreatic ductal stenosis, pseudocyst and chronic pancreatitis of the portion drained by the dorsal duct in a pancreas divisum. Internal drainage of the cyst was decided. An upper gastrointestinal endoscopy was performed and a cutting was undertaken by means of a needle knife at the point of a major bulging in the duodenal bulb. A 10 French 5 cm long pig-tail stent was introduced, thus securing the internal drainage of the cyst. Biochemical tests of cystic fluid were consistent with a pseudocyst. The pig-tail stent was extracted after one month. 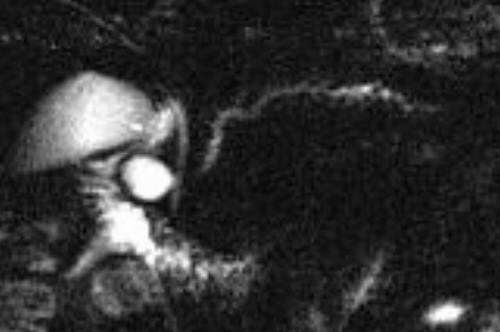 Following the drainage of the pseudocyst, the patient experienced complete remission of the episodes of recurrent pancreatitis for a two years period follow-up, but he is still, infrequently, complaining of mild upper abdominal pain. Imaging evaluation during follow-up confirmed elimination of the pseudocyst, but the patient is still under clinical follow-up. Title: ERCP Cannulation of the major papilla and injection of contrast medium results in opacification of a short ventral pancreatic duct and its secondary branches. The dorsal pancreatic duct is not depicted and there is no apparent continuation of the ventral duct along the body and tail of the pancreas. 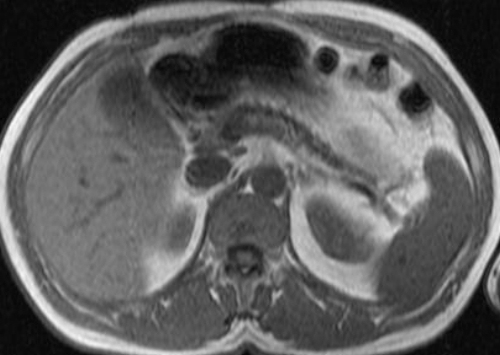 Title: Spoiled gradient echo fat suppressed T1-weighted sequence Axial section at the level of the pancreas, demonstrating significant atrophy of the pancreatic body and tail. Title: T2-weighted spin echo, axial image. A sharply marginated round lesion 2,5 cm in diameter, with high signal intensity, consistent with a pseudocyst in the pancreatic head. Title: Projectional single shot turbo spin echo MRCP A dilated and tortuous pancreatic duct with associated beading of side branches in the body and tail of the pancreas is depicted, along with a short stricture of the duct in the pancreatic neck. The normal appearing common bile duct and the main pancreatic duct were shown ending at different parts of the duodenum after crossing over each other at the head of the pancreas. 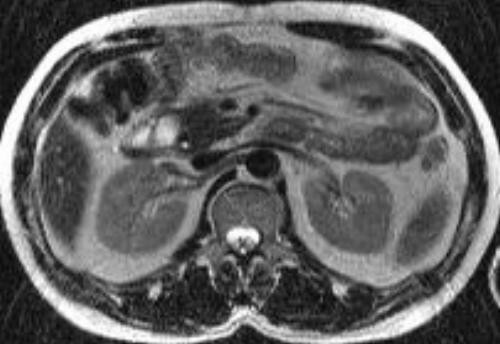 A cyst is demonstrated in the way of the dorsal pancreatic duct. Pancreas divisum (PD) is not an uncommon congenital anatomic variant that results from failure of the ventral and dorsal ductal systems to fuse during the 6th to 8th week of embryological development. The main portion of the pancreas is drained by the dorsal pancreatic duct through the accessory papilla and only the posterior-inferior part and the uncinate process of pancreatic head are drained by a small and short ventral duct that joins the common bile duct in the ampulla of Vater . Drainage of most of the pancreatic secretions through the accessory papilla, that is less wide than the main one, may result in high intraductal pressure in the duct of Santorini. This "functional" obstruction of the dorsal duct orifice has been assumed as a cause of acute pancreatitis [1, 8, 6]. The prevalence of PD has been reported from 0,8% to 7,5% on ERCP series  and it is found in 5–10% of autopsies . The diagnosis of PD is based on ERCP findings, when a short isolated ventral duct is depicted, as in our case, or when two separate pancreatic ducts, that do not communicate to each other, are identified . MRCP is considered an excellent technique in the diagnosis of PD by demonstrating the crossing of the distal common bile duct with the dorsal pancreatic duct and by revealing separate drains for the main pancreatic and common bile ducts [4, 7]. PD has been associated with episodes of acute recurrent pancreatitis and relapsing abdominal pain [2, 13, 16]. The relationship of PD with chronic pancreatitis has not been fully illuminated yet, although some reports- based mostly on clinical, laboratory and ERCP data- suggested that this congenital variant, may have a role in the pathogenesis of chronic pancreatitis [1, 13–15]. Pancreatitis due to blunt abdominal trauma in patients with PD has been previously described on ERCP in only three cases, to the best of our knowledge [16, 17]. Blunt abdominal trauma is considered to be the cause of one fifth of all cases of traumatic pancreatitis and it may result in contusion, parenchymal fracture, or ductal disruption . Pancreatic trauma may lead to pseudocyst formation, abscess or pancreatic fistula formation . Pancreatic pseudocyst may also be developed after an acute exacerbation of chronic pancreatitis . It is unclear if the cyst is related to such an exacerbation of chronic pancreatitis in our patient. But we consider that the cystic lesion might be secondary to the blunt trauma, as a CT scan that was performed by that time, showed a peripancreatic hematoma at the pancreatic head. Ductal injury is usually followed by a more severe clinical course in the posttraumatic period than in our case. As opposed to the duct of Santorini which was injured, the duct of Wirsung was intact in our patient; this may account for the absence of atrophic changes in the pancreatic head and the relatively mild clinical course. MRCP showed morphological alterations in the dorsal pancreas, consistent with chronic pancreatitis and the cross-sectional T1 and T2-weighted images demonstrated atrophy of the pancreatic body and tail. ERCP failed to depict the dorsal duct probably because its stenotic orifice. The association of PD with chronic pancreatitis limited to the dorsal duct has been previously described in 16 patients on ERCP  and in 2 patients on MRCP [3, 5]; in all cases there was no evidence of traumatic injury of the duct. In our case, internal drainage of the pancreatic pseudocyst was beneficial and resulted in symptoms' remission. Pancreas divisum may interfere with the clinical course, the post-traumatic changes and the sequelae of blunt trauma in the pancreas. MRCP is able to diagnose pancreas divisum and demonstrate changes of chronic pancreatitis. Furthermore, due to its non-invasive nature, it can replace diagnostic ERCP in evaluation of patients with chronic abdominal pain and hyperamylasemia after blunt abdominal trauma and may help in designing endoscopic intervention.